Hello Kim's sweet friends!!! 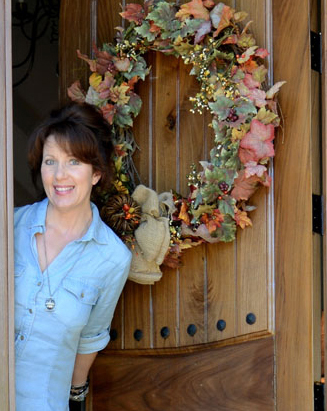 I'm Robin and my blog is All Things Heart and Home. I'm so happy to be hanging out with you today! Like you, I love Kim's eye for design, her beautiful home never ceases to inspire me, so when she asked me share my favorite room I was thrilled! The den is what sold me on this house 2 years ago...ya see, we were looking for a space that would give us enough room for our family get togethers. This den, which is really open to the rest of the living area - has high ceilings and lots of room for our peeps! And during the day, light pours into this room, making it near impossible to be glum when you're in here! I'm in here an awful lot...I could work in several rooms in the house but I find myself drawn to this space. Maybe it's because from my chair, I can see the bird feeder just outside one of the windows ...it's always full of birdseed and there are always little birds flitting and perching and singing for their supper! the rustic tables on each side of the fireplace made from 250 year old beams...I so love the color and the texture of old beams and they work well in the den because I think the tall stone fireplace begs for a few other rustic elements. The space for family, the light, the birdsong, the sound of the waterfall...maybe that's why I love this room the best! I'd love for you to visit me at All Things Heart and Home-come over and introduce yourself! Thank you, Robin for opening up your home and sharing your favorite room with us. If Robin's blog, All Things Heart and Home, is new to you I hope you will pop over and say hi. I have been following Robin since before I started blogging and met her in person a couple months ago. 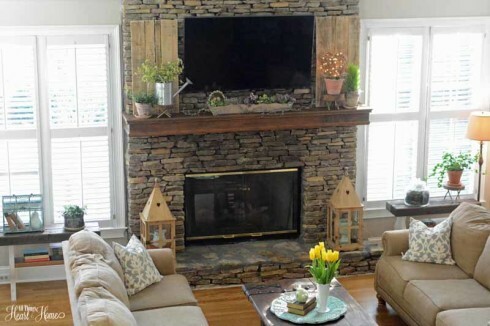 She had me at those beamed tables and birch stump table!...Beautiful, beautiful room...a room where anyone would feel welcomed and part of the family...Love everything about this room and glad she shared that gorgeous Christmas pic of the fireplace/mantel...Love your room Robin. Thanks for another great feature today Kim and have a great weekend ladies! 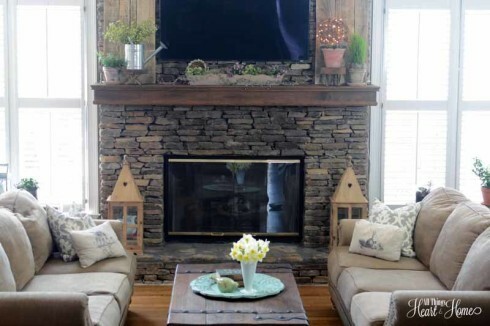 Great feature Kim, I just love the fireplace and the open feeling of the whole room. Thanks for sharing today. Have a great weekend. Oh, what a house!!! Thank you for sharing, Kim! May I move in in the minute??? I love how big and open the room is and Robin was still able to make it feel so cozy and inviting. 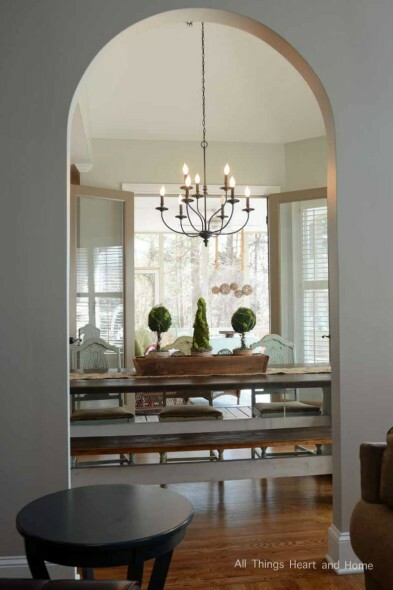 There are so many great details in the room, especially that gorgeous fireplace, beam ceilings and built ins! She has decorated the room so beautifully. Great feature! Robins home and favorite space is just as beautiful as she is. thanks for sharing today. hope you have a great weekend! You had me at birdsong! I love watching the birds and listening to their songs, too. Robin's home is gorgeous! Love the tree stump end table. I love Robin's home. The beams in that room and the warm rustic feel of the fireplace just make me want to sit there and relax. It's just beautiful.. Thanks for sharing Kim! What a lucky warm and inviting home. 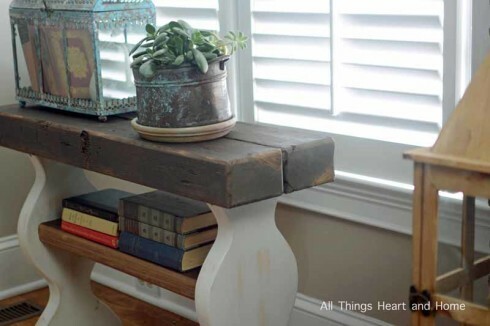 LUV... luv the tables made with old beams. Thanks for sharing ladies. I love that fireplace framed by those gorgeous windows. I'm so glad Robin chose not to clutter the windows with drapes. 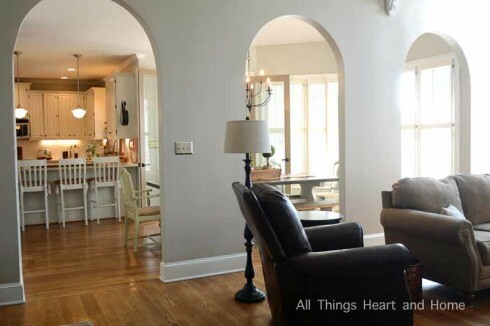 Those "open" windows along with the high ceilings really give the room an spacious, airy look. Beautiful space! Robin your Den is so warm and inviting. I love the little shutters on the mantle, those beam tables, the stump table and is that a farm table with benches I see peeking through in the kitchen? Thanks so much Kim for sharing Robin and All Things Heart and Home with us today! 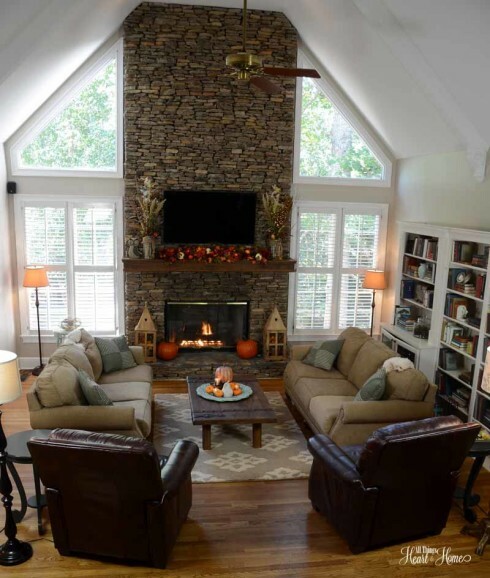 It can be hard to make such a large room with soaring ceilings warm and inviting, but Robin has done that. Love how light-filled and open everything is. Those benches/tables that they made to go beside the fireplace are a great addition. And the stump table is so unique! Thanks for sharing. I always enjoy your Friday Features. The beamed table is GORGEOUS!!! What a beautiful room filled with light. Robin, your family room would have sold me too! What a beautiful space... and you have it decorated perfectly. Comfy and so stylish! LOVE the views into the other rooms, too! Thanks Kim! What a beautiful home and blogger! Beautiful home. Your front door looks amazing and I wish I could see it better. Your consoles made from those beams - incredible. Where did y'all find those fantastic beams if you don't mind sharing, please? I bet they are really heavy. They look fantastic with your fireplace which is FAB !!!!! Kim, thanks for the intro. Robin's home is lovely! I'd love to cozy up to that fireplace myself! Heading over to her blog now to pay her a visit! 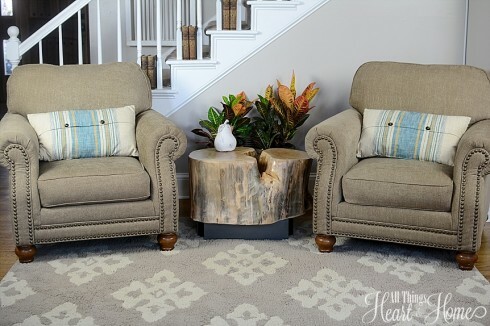 Beautiful decorating and especially love the tree stump table! Beautiful room, Robin! Thank you for sharing, Kim. I love the high ceilings. I always wish that we had high ceilings at Christmas time so I could have a tall tree! 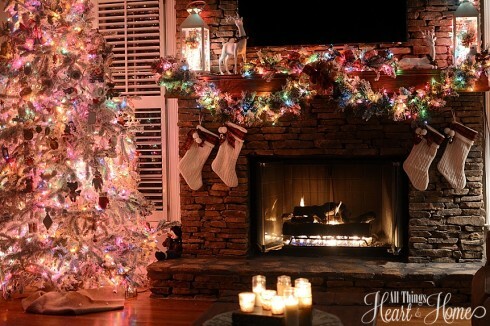 I love the way you decorated the mantle! The watering can is so cute!